Centrally located, New Ubud hostel a chilled out place were you can enjoy the city of Ubud . 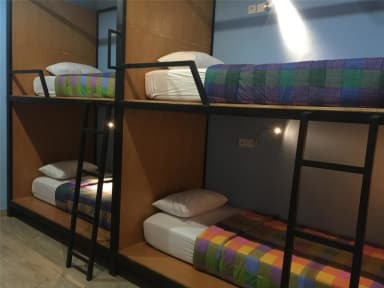 New Ubud Hostel jut lest than 2 minute walk from ubud market and the famous Ubud Palace the Royal family Ubud Dormitory's consist of 8 beds designs with long capsul and en-suite shared bathrooms. Hot shower and separate toilet. and all room with Ac. and we do over shuttle service. Friendly, knowledgeable staff to help with tours or transport bookings during your stay in Ubud and also we do over for the mount Batur Trekking every day and all activities. Its in downtown ubud . Super easy to get around . We had a nice stay at the New Ubud hostel. The bed layouts offer a lot of privacy and the beds themselves are very comfy. The hostel isn’t too conducive for socializing though, as there is no real places to hangout. It’s very centrally located within Ubud and the Palace, art market and monkey temple are close-by. The Hostel is a bit hidden on a sidewalk in a sort of temple!? but its located very well for a couple of nights in Ubud! The bed was clean and comfy but the bathroom could be a bit cleaner... but nothing really bad to worry about. Staff was friendly. Lockers were outside of our rooms. Good value. A bit more style would have been nice, but thats just what i like! I question if this place wants to stay in businesses. I was given a bed covered in vomit, with vomit on the walls. I switched beds & that one came with dirty sheets. They don't clean the bedding. I used my sleeping bag. Bathroom- roaches, ants and mold. Floor design is a huge health issue plus breeding ground for bugs. They don't clean the bathrooms or dorm rooms. Male staff- disrespectful to guests. Told no spare key for the locker, when there was. I couldnt get my things. Booked this based on the below reviews but it’s nothing like what had been described. We turned up and our beds weren’t ready which was fine, so we left our bags and went out for the day. When we returned early evening they still hadn’t been done and we had to ask for sheets. Bathroom is dirty, covered in mould and the showers had cockroaches in them. So bad we ended up leaving two days early. The only positive about this hostel was the location, very close to the Main Street. Very disappointed. Never had a dirty bedsheet sleep on ever. No people arround. Location was good but only for one night.